Hello, everyone! We are drawing closer to the end of January and that means the next big card giving day is just around the corner! Today I am featuring an image and sentiment from the Red Rubber Designs "I Heart You" stamp set. 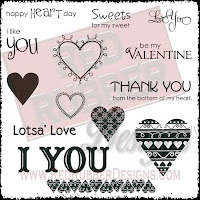 I love when I can stretch my stamping dollars and this set includes a variety of sentiments to fit several occasions, not just Valentines! Today I am featuring a Valentine and a Thank You note. First up, a bright Valentine. To create this fun look I sprinkled Brushos (Orange, Scarlet, Brilliant Red) on mixed media paper then spritzed with water. 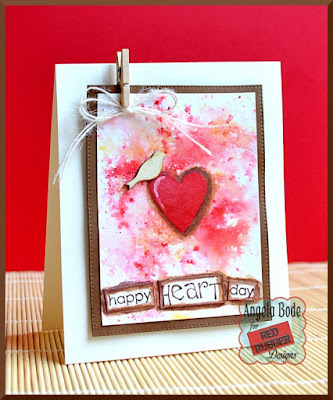 When the paper was dry I stamped the solid heart image from the I Heart You stamp set in Memento: Love Letter. I then shaded the heart with Inktense pencils and water. The sentiment was stamped and then cut apart. For my second card, I created a "thank you" note. I heat embossed the image and sentiment with clear embossing powder. Next I sprinkled Brushos and spritzed with water and repeated this step several times to achieve a saturated look. Lovely cards Angie - cheerful colours to brighten a grey UK day. Awesome use of that stamp set Angie!! Fabulous techniques and colors! Great cards, Angie. I like how you added a highlight to the heart on the top card. Really adds the dimension. The Thank You card is just so unique with the deep brusho back ground. I see you are getting a lot of use out of your Brusho product. These are really pretty Angie! Love them!